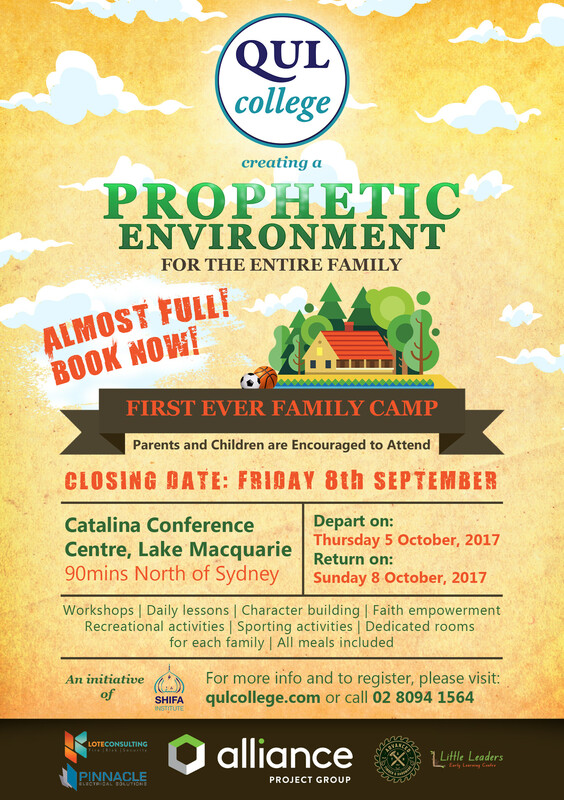 Q: What are the dates for the camp? A: The departure date is on Thursday 5th October 2017 and returning on Sunday 8th October 2017. Q: Where is the camp site and what activities will be available? A: The site is located in Rathmines, Lake Macquarie. The program will include lessons and workshops, fishing, sporting activities and other recreational activities. A: Families will need to make their own way up to the site. A map to the site is located here. Q: What will the accommodation be like? A: Each family will be allocated their own room. Q: How much will the camp cost? A: The cost is $165 per adult for the 3 nights and the cost for children (anyone under the age of 16) is $90 total for the 3 nights. A: All linen, pillows and blankets are provided at the site. You should bring swimming clothes, snacks and writing material. Q: Can children attend without their parents? A: All children attending must be accompanied by an adult guardian. Q: How many people can fit in the rooms? A: Most rooms can be customised to accommodate up to 8 people. « Why Can’t We All Just Unite on Eid?